Bubble Eye Goldfish (Carassius auratus) also known to tropical fish keeping enthusiasts as the Water Bubble Eye Goldfish, are descendants of a species of Central Asian (Siberia) wild carp known as the Prussian Carp, Silver Prussian carp, or Gibel Carp (Carassius gibelio). Bubble Eye Goldfish are one of the more than 125 captive bred fancy goldfish varieties, that like their ancestors, inhabit slower moving and stagnant waters of rivers, lakes, ponds, and ditches where they feed on plants, detritus, small crustaceans, and insects. 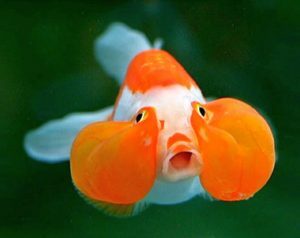 Bubble Eye Goldfish were originally developed in China, and by the early 1500s were vigorously traded in Japan. By the 1600s they had made their way into Europe, and eventually by the 1800s into the Americas. Throughout the centuries, Asian breeders developed the majority of fancy goldfish colors and shapes that we see today in the tropical fish keeping arena, including the Bubble Eyes and closely related Celestial varieties. Domesticated goldfish are now distributed world wide. 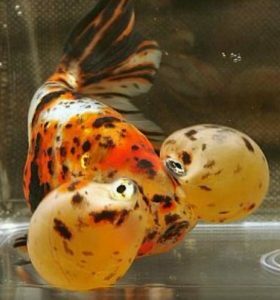 Bubble Eye Goldfish are an egg shaped variety that have a double tail, no dorsal fin, and upturned eyes above fluid filled sacks that begin to develop when they reach 6 to 9 months of age. Their body size and shape is similar to the Celestial Goldfish, which is a bit slimmer and whose eyes are more extremely upturned. They have poor eyesight and although most specimens purchased in the Americas do not have dorsal fins, one China bred variety is bred with a dorsal fin. Mature Bubble Eye Goldfish generally grow to a length of 5 inches or more. When they reach 2 years of age, the two distinguishing fluid filled pouches of skin on it’s cheeks become almost grossly large and delicate looking. They are bred in a variety of solid colors that include red, blue, chocolate, and black; as well as red/white, red/black, and calico bi-colored specimens. Bubble Eye Goldfish are best housed in a tank of at least 20 gallons with a medium gravel substrate, decorated with some colder water plants, a piece of driftwood or bogwood, some smooth rocks, and floating plants to diffuse overhead lighting. Keep in mind that their fluid filled sacs are delicate and can become a problem with sharp edged rocks, driftwood, or plants. They are scavengers and tend to uproot live plants, especially when planted in fine gravel or a sandy substrate. Bubble Eyes are a social species that should be housed with at least 4 or 5 of their own kind, but do not overcrowd. They are a slow moving species that should be kept with other slow moving relatives like the Lionhead Goldfish, Telescope Goldfish, and Celestial Eye Goldfish. Although none of these varieties will win any races, when kept together they should get plenty to eat. Because they are one of the more delicate species, they should never be housed in a community tank environment. Because all goldfish produce a tremendous amount of waste, they need regular water changes and a good filtration system that does not create a strong flow of current in the tank. Bubble Eyes require a lot of oxygen, so an air stone is recommended along with a tank that provides the maximum amount of surface area (breeder tank) per fish. Like all species of goldfish, the Bubble Eye Goldfish is not a true tropical fish. They are a cold water species that does best at temperatures between 65 – 72° F but unlike other goldfish species, they cannot tolerate temperatures under 60° F. They can tolerate salinity levels below 10% and specific gravity less than 1.002. Bubble Eye Goldfish are egg layers that are moderately easy to breed in an aquarium environment. They are usually bred in groups as small as five individuals and in the wild, spawn during the spring. To mimic these conditions in an aquarium, provide healthy fish with a tank planted with Anacharis or other oxygenating plants, solid surfaces (like clean slate) for the eggs to adhere to, and/or spawning mops. Induce spawning by feeding the fish live brine shrimp, worms, etc. several times a day, slowly lowering the water temperature to around 60° F, and then slowly warming the water approximately 3° F per day until spawning commences. Spawning activity will usually occur when the water temperature reaches between 68° and 74° F. During this process, the water quality in the breeding tank should be maintained with daily partial water changes of up to 20 %. When the fish are ready to spawn, the male will push the female against the plants to stimulate her. She will drop tiny eggs that when fertilized by the males will adhere to the plants, slate, or spawning mops by sticky threads. Females can lay as many as 10,000 eggs per spawn over a period of three to four hours. Separate the parents from the eggs immediately after spawning as they will devour as many eggs as possible. Depending on the water temperature, the fertilized eggs will hatch in 4 to 7 days. Feed the fry specialty fry foods until they are able to consume crushed goldfish flakes or brine shrimp. Bubble Eye Goldfish are omnivorous and will eat all kinds of fresh, frozen, and flake foods. A good quality flake food with supplemental feedings of live, frozen, or freeze dried brine shrimp, blood worms, Daphnia , or tubifex worms will keep them free of parasites or bacterial infections. Avoid overfeeding but because of their poor vision and bubble sacs under their eyes, allow them plenty of time to eat before removing excess food from the tank. Bubble Eye Goldfish are relatively inexpensive and readily available online and in tropical fish keeping shops in a variety of sizes.